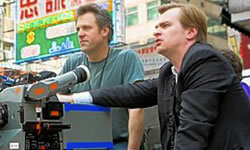 Nolan Fans have happened on an interview with Wally Pfister, longtime cinematographer for Christopher Nolan’s films including Batman Begins, The Dark Knight and Inception. Pfister discusses the highly anticipated third film in Nolan’s Batman trilogy, The Dark Knight Rises. The interview was conducted by the “Kevin and Josh Movie Show” (full audio here) and Pfister opens up on several details eager fans are likely to eat up. On how can Nolan top The Dark Knight? Again, you can listen to the full interview here. The Dark Knight Rises is slated to hit theaters on July 20, 2012 with Christian Bale returning along with Michael Caine, Gary Oldman and Morgan Freeman. Tom Hardy will play the film’s lead villain Bane and Anne Hathaway, as already stated, will play Selina Kyle. Shooting is expected to take place in London and Los Angeles in May.